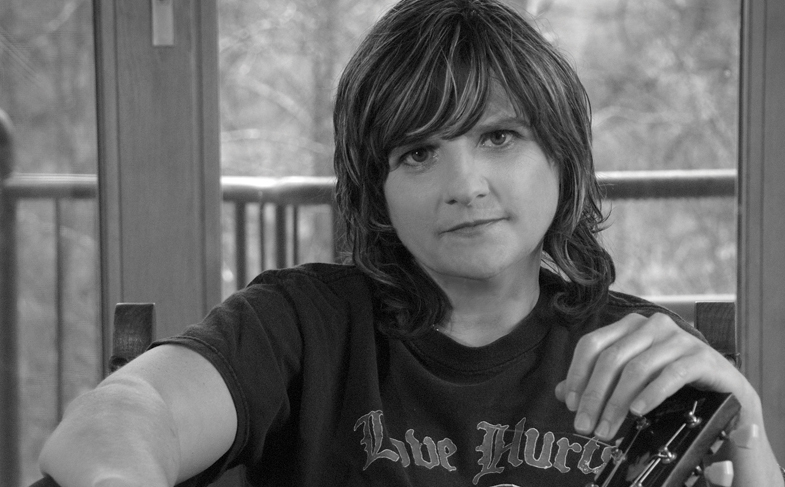 Amy Ray’s home sits in one of those pockets of Appalachia that defy the most sophisticated GPS system. Getting to her 80-acre, Etowah River spread requires the proper gear and close attention to topography—switchback loops, steep grades, sudden dips—instead of signage, which is practically nonexistent in the Lumpkin County backcountry. Many of the roads in her brambly, unmanicured neck of the woods are unpaved and cross-hatched with deer tracks and old logging and mining ruts from the area’s gold-rush past, and odds are that somewhere nearby, half-buried in a creek-bank, are some Mason jars that still reek of moonshine. The terrain is both rugged and feminine, its horizon curvy and sloped like the earth’s own odalisques. To navigate this landscape without getting lost, you have to know it by heart. Ray’s most recent solo project, Goodnight Tender, her first country album, proves that she has studied every pig trail, outcropping and fallen log, down to the last striated lichen. “It would be hard to live here and not have banjos influence what you do,” she says from her northeast Georgia living room, a few miles from where Fiddlin’ John Carson, the first country artist to make a record, jammed on the square in Dahlonega, and about an hour away, depending on Atlanta traffic, from where she grew up in Decatur. Older, more mainstream audiences know the singer/songwriter as half of The Indigo Girls, the Grammy-winning duo who shot to fame in the 1980s, with Ray providing the tenor scaffolding for spiraling harmonies with Emily Saliers. They still write, tour and record together, consistently impressing critics and fans with their eloquent lyrics and gravel-and-silk sound. Ray, meanwhile, has long enjoyed a successful career on her own, releasing five other solo projects, served up in varied badass trappings of rock and punk. She growls, she shouts, she whips her heavy curtain of bangs, and her socially conscious audiences do a gentle, considerate form of slam-dancing. Joan Jett and The Butchies accompanied her on Stag, her debut outside The Indigos, and those influences helped set the gritty tone. So Ray’s newest release, which is country in its purest, and purist, sense, took some listeners by surprise. Harlan Howard famously summed up country music as “three chords and the truth,” and Goodnight Tender, released in January by her indie label, Daemon Records, offers the kind of stripped-down melodies, honest, hat-in-hand emotions and keening pedal steel and old-time strings that once emanated from tear-stained, honky-tonk jukeboxes. “This material is more visceral than intellectual, with a wistful sense of the creek and the dirt, as well as unrequited love,” she says. “I like to think of my dog watching over the people and land I love, guarding and ‘tending’ them, when I’m away from home,” she says. To achieve that achy sound, she convened artists she trusts with fiddle, banjo, dobro, pedal steel, Wurlitzer piano, bass, and percussion. Ray also took pains to keep the technical end of the project as authentically retro as possible. All in all, the result is more paleo-country than anything Music Row has (over)produced lately, and Ray is eager to explain, with characteristic modesty, how this scenic detour, from folkie to folksy, was not quite as out of the way for her as it seems. Ray, who just turned 50, was born in Decatur. Her mother went to Emory on scholarship, and her father was a radiologist at Georgia Baptist Hospital. She has two sisters (all gay, she notes) and a brother —a happy, close Methodist family that gardened and kept bees together. Instead, Ray and Saliers—a bohemian pair of friends who shared the same intense gaze, bookworm intelligence and empathy for underdogs—would sneak into Atlanta bars with fake IDs and perform Patti Smith covers. After graduating, Saliers attended Tulane and Ray went to Vanderbilt, but, feeling homesick, they both eventually transferred to Emory University, where Ray double-majored in English and religion. In 1987, during the ascendancy of folk femmes, an A&R rep who was visiting Atlanta to see R.E.M caught the women’s act at the Little Five Points Pub. Epic Records signed the act, and their self-titled, major-label debut yielded the hit “Closer to Fine” and a Grammy for Best Contemporary Folk Album. From then on, The Indigo Girls established themselves as platinum-selling fixtures in the music industry, as well as vocal political and environmental activists and out-and-proud icons in the LGBT rights movement. Ray’s versatility is almost as pronounced as her humility. Despite her musical achievements, it was only last year that she first sat in with the locals who regularly gather, in un-ironic overalls, to play bluegrass and mountain music on the Dahlonega square. Why? Ray felt “intimidated” by the twangy chops on those laconic old-timers. Just after Ray started experimenting with more high-lonesome sounds, she encountered someone who made her feel less lonely. Schrader, who grew up in the Pacific Northwest, still puzzles affectionately over Ray’s deep-seated “devotion to Jesus” and pride in a conservative region that traditionally has resisted many of her sociopolitical ideals and causes. With just enough venom to do some hurt. A friend drops by bearing veggie burgers from the Yonah Burger, and the two catch up and reminisce. Then she scoops up Oziline in a infant sling and takes her family’s three dogs for a walk, crunching through the leaves on the forest floor and pointing out the funny-looking knotholes in trees to her daughter.